Last night before bed I drew the rune isa - the rune of ice, stillness, concentration and rest. 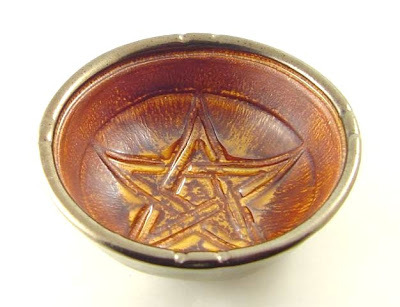 Interestingly, earlier in the evening, I had just purchased a handcrafted pentacle ritual bowl to complement my fehu gold fire pentacle ritual bowl. 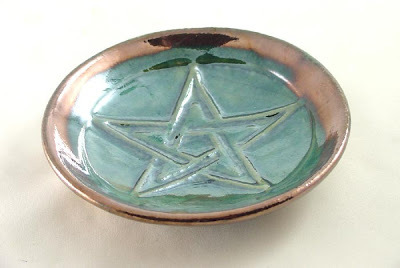 My newest pentacle ritual bowl gleams with the irridescent colors of teal and green with copper. It's gorgeous and perfectly complements the gold fire fehu bowl. The mystery of gold, fehu, is a force which flows like fire. Shown above is my newest ritual acquisition - a handcrafted fire pentacle of gold ritual bowl. I received it just a few days ago. All in all, the F-rune defines a mobile form of power. In the psycho-magical realm this concept of mobile force is closely connected with the old Germanic idea of the hamingja. 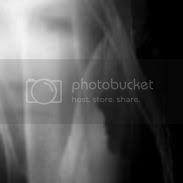 The hamingja (which is often translated as "luck," and even "guardian spirit") may be sent forth from an individual in a manner akin to that of the "astral body" in other traditions. Fehu is the directed expansive force that facilitates the projection of soul entities and magical power from person to person, or from a person to an object. Fehu is the mystery of gold. That is, it is the numinous power of that which is called money or wealth in our society (which is now dominated by "pecuniary mysteries"). This rune exists in a great ecological system of power or energy. 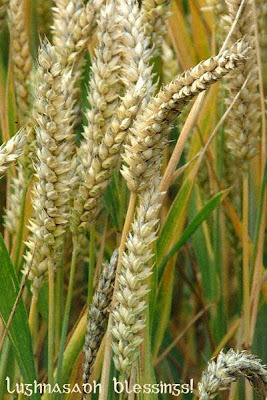 The rune must be yielded into receptive fields - : : in order to be increased. It increases in power through circulation, and it is transformed from one shape into another. This must not, however, be done blindly but rather with foresight and wisdom. The power naturally belongs in the hands of the true æthelings, and it is their responsibility to see that it is properly used. Fehu is the power of well-being, renewal and success. Wealth, be it material wealth or inner wealth in the form of wisdom, understanding and knowledge must be shared generously and ethically to tap into and increase the power of fehu. In my own magical practice, as it pertains to inner wealth, I generously share my own wisdom, understanding and knowledge with those who are receptive to that which I have to share in the experiences I write of on my blogs. Having myself as a blogger been naturally driven to do this for many years, fehu is the force within the soul which drives bloggers to write and to share our experience. Last night before bed I drew the seventh rune, the second rune in the second row of my developing personal runerows. It was fehu (pronounced fay-who), the 'f' rune, the rune which contains the mysteries of both creation and destruction, harmony between creative and destructive extremes, the guardian spirit, mobile power and wealth, bringing light forth from darkness, and the ability of the true ætheling to "read the runes aright" in divinatory rites. This rune follows perfectly my previous rune dream, after which I was prompted by inner forces to confirm by omen the truth of the rune reading. This dream I dreamt I brought to a different waking conclusion than I did with the previous dream corresponding to mannaz - I cut off it's energy and made it nothing. I rejected it and destroyed it's message. As a true ætheling, I called upon my power to "read the rune-dream aright" in a manner other than merely discerning truth - I created a new truth - using my free will as a Living Heir of the Divine to alter fate, to loosen the deep pattern of wyrd and to reweave the threads of that which shall become. The Hagalaz Rite is a protection rune ritual which banishes and prevents the return of baneful forces disadvantageous to one's runework. Edred Thorsson mentions it by name in his book (Futhark), describing it as a protection ritual which "provides the most potent magical atmosphere and potential." The formula and content of the Hagalaz Rite is not specifically given. Nevertheless, the Hagalaz Rite I performed naturally supraconsciously (without conscious intent) within the magical context of my fourth rune-dream, namely, The Wholiness Code. Seven people are dead and two critically injured in a massacre at a southeastern Georgia mobile home, though police won't say whether they think the killer is on the loose or among the dead. "This is a record for us. We've never had such an incident with so many victims," Doering told reporters. "It's not a scene that I would want anybody to see. In Jewish kabbalah, seven is the magical number-letter (zayin) of an adornment - like mannaz is the adornment of the ship of safe passage in relationship to my dream. Again, the magical alphabets of my ancestors are in agreement within me. There was a massacre ... on a tract of land which is all that remains of a Crown - just as the massacre in my dream concerned the cut up crown of a woman's head. The first owner of the land was involved in 'politics and wealth' as the President of the Continental Congress in 1777 - just I was chosen by the President in my dream to investigate the massacre. The President's tract where the massacre occurred is called river lands in the news article - which links to Mysteries of the Staircase, the rune dream previous to last night's rune dream which contained references to a race of land-bound people and a race river-ice people. Last night before bed I drew the sixth rune, the first rune of the second row in my developing set of personal runerows. It was the 'm' rune mannaz (pronounced mawn-nawz), the rune of Divine consciousness made manifest in the individual and within the race of humanity. Mannaz is also known as the adornment of ships, the androgyne and the guardian of the institution of blood sisterhood. Political structures and of the wealthy filled the atmosphere. I was neither a political figure nor wealthy in the material sense, but for some reason I was among these kinds of people and in the politically charged situations. I wasn't a central figure, but my presence had been deemed needed. I was just there - just in case I had been chosen as some believed I was. Some weren't sure if I had been chosen, so I was given no real role in the proceedings - I was only there because some believed I had been chosen. So, I was just there, one among this group of people. Then, news was delivered to the gathering. There had been a horrific massacre of a group of people. I was chosen by the President to go with the team to investigate the crime scene. We went to investigate. There was blood all over the place. The people in the place had been brutally butchered, literally. The people had been killed on account of one particular woman's presence, they were her supporters and her group. She had also been killed. Looking around the place, I 'saw' back in time the manner in which the woman had been particularly gruesomely butchered and cut up - her head had first been methodically cut in half from the crown of her head down to her neck. Then, both her breasts had been chopped into large chunks and then rechopped into smaller chunks. The vision was awful, but in it was also a message. That this gruesome fate had been called up and sealed for either this woman or myself was the message. We could not both occupy the office for which I had been chosen. The actuality of the fate had been called up to discern between us. Watching the woman's dissection at the hand of the Reaper, I did not feel she had been a woman obviously deserving of such a horrible fate. Nevertheless, having been summoned (by whom I don't know), the Reaper reaped. With it's association as the adornment of ships, mannaz follows perfectly from Thursday night's dream, Mysteries of the Staircase. Last night before bed I drew the fifth rune I have ever drawn. It was the 'i' rune isa (pronounced ee-saw), the rune of ice, cosmic stillness, concentration and rest. In the dream, in order, there was one ship. There was one road with two sides. There were two races of people. There were two rivers. There were two babies. There were two women. There were two dogs. There was only one me and only one wildish man with steel teeth able to interpret the code which dwells in me. I remember nothing about the ship except that it was there. Then, I was in a bus traveling with others down a road. I had a window seat on the left. Looking out of the window on the side of the bus I was on, I saw that many of the shoppes in the town through which we were traveling and which lined the road had witchcraft-related signs on their storefronts and in their windows. It was nighttime, but the street was softly and warmly lit by pretty quaint streetlamps all along the road. The walkway in front of the shoppes glowed comfortingly. I was traveling down a road through a town where witches thrived. I was happy. Then, of one race of people I don't remember much except that they seemed to be land-bound and I was running from them for some reason. The second race of people were people who lived in a river of ice and whose bodies were largely composed of ice. Hiding in the icy river from the land-bound people, I discovered the ice people. The ice people were known throughout the world in the dream as all-fearsome and terrible. They were the 'terrible ice' people and the land-bound people were land-bound because they feared the incredible power of the terrible ice people. The terrible ice people took me in, protected me and kept me moving up the icy river so that I would not die in the terrible iciness of it. Safely upriver, I emerged upon the right bank. Then, I came upon a baby who was pulled out of a dark river with the dying in it. It was dying, blue skinned and on the brink of death. It had been left for dead with the man who buries the dead. The man there who buries the dead had placed the baby in a wooden box for burial already, but the baby - though very near death - was not quite dead yet. I could still see it struggling for it's last breaths. I couldn't stand to think that the baby would die like that - in a box struggling for breath with no one to hold it in it's dying moments. All alone in death. I took the dying baby out of the box and the man responsible for the dead let me do it. I told him I would hold it as it died so that it didn't have to die all alone laying in a cold wooden box. I let the dying blue baby nurse from me. It stopped struggling for breath and expired peacefully in my arms. Then, I was in the front passenger seat of a moving car. The woman driver was holding a chubby living baby she had adopted while she drove. The baby's mother had died, but I saw the spirit of the baby's dead mother hovering over the driver of the car, nursing her living baby from the spirit world. Then, I was standing on a sidewalk after getting off a bus with many others. It was daytime. There were two women reporters standing near me. They were arguing about who was going to get to report on this story. Both of them were pretty and each thought she herself would be chosen. Neither of the two women reporters was chosen. Unexpectedly, I was chosen. The team sent to report on the story told me to go inside the house - a wildish-like man lived in it - and give them the inside scoop. People were a bit afraid of him I think because he was so 'outside the box' in terms of his lifestyle. They wouldn't go inside his 'demon' domain. I wasn't afraid. I am a witch, after all. Then, I went inside and heard a fierce noise nearby. Turning to see, I saw two 'guard' dogs rising up from underneath a old low-laying whitish-greyish somewhat wide staircase that, although it was clearly a staircase with stairs, the floors which it connected together were the exact same floor. By the time two 'guard' dogs reached me, I could see that they were really sweet docile dogs with the cutest friendliest eyes. I heard the wild-man's voice from another direction, muttering to the dogs as he approached, "you are sorry excuses for guard dogs." He petted them lovingly and smiled. I saw that he had steel teeth, long hair and a mildly untamed look about him. Then, we became really good friends. Actually, we became lovers and he began interpreting my code. In all the world, he was the only one able to do it. He would throw out and report tidbits of it to those waiting outside there to report on the code. Clearly, this dreams links to the staircase of my earlier dream (Transmission of a Sacred Secret). Last night before I went to bed I drew a rune, the fourth rune I have ever drawn. It was the 'h' rune hagalaz (pronounced haw-gaw-laws), the rune of sudden change or new opportunity. Then, I dreamt ... of an awesome lightning bolt to the west. The lightning bolt was extremely powerful, with thick lines of energy shaped like hagalaz. The lightning bolt remained reverberating brilliantly in the night sky for an extended period of time - it didn't flash and disappear. It stood in the sky like a sign for a very long time, as if it wanted me to definitely see the shape of it and to take in its power and message through my gaze. It was protecting me and it wanted to make sure that I gleaned that message from it's manifestation. It's manifestation in my dream was a direct consequence of the act of protecting me. It wasn't a mere lightning bolt - it was a living energy with purpose. The lightning bolt of hagalaz brought with it thunder louder than any thunder I have ever heard in the concrete world. It seemed to reverberate and penetrate through many worlds. Hagalaz contains the code of cosmic life and dynamic wholeness. It is the rune-mother of all the runic forms. It is the complete drop of knowledge and connects realms of being - thus, hagalaz follows perfectly the three runes of my previous dream the previous night (Transmission of a Sacred Secret). Sunday night before bed I drew my first rune. It was Raidho (pronounced rye-though), the 'r' rune, signifying right order of cosmic law and wholiness. Monday night before bed I drew my second rune. It was Elhaz (pronounced ale-hawz), the 'z' rune, signifying protection and linkage of the Witch and her personal Divinity, her daimon and her genius. Last night before bed I drew my third rune. It was Perthro (pronounced perth-row), the 'p' rune, signifying the guarded secret of ørlög and the way of wyrd. I was at a small older house. It was my house, but it was not any house I have ever lived in. I was looking at it to move into, I think. The person showing me around was telling me about features of the house as we moved through it. We came to the small humble kitchen. I spied a small closed inside doorway across from the doorway to the outside in the kitchen, like a broom-closet door. Immediately I 'saw' that an exact replica of the seemingly one story home existed as a second story to the house and this doorway led up a narrow staircase to it. I stepped toward the closed doorway to go up to see the home upstairs. The home now had a very discernable good spooky feel to it - to outsiders and enemies it would be very scary like a real haunted house, but it was goodly spooky to me. I felt thrilled inside. The person showing me around said "you don't want to go up there. A Witch lives up there." "Ohhh, but I do want to go up there," I thought. I moved past the person who was showing me around and stepped again toward the doorway. Just then, the outside doorway in the kitchen opened suddenly and a ritual procession of the Witch's coven and her witchy 'children' came through. They all wore hooded black robes, with their heads angled down yet positioned straight ahead toward the inner doorway, such that their faces were hidden from those looking on at them from the side, like I and the guide were. But, as each one passed beyond the guide's direct line of sight and came directly opposite me on their way to the inner doorway (which was now open), each covenor turned and looked directly, powerfully and penetratingly into my eyes, held my gaze for prolonged moment, and then turned his or her face again toward the inner doorway. There was an immediate deep wordless mutual communication transmitted through each connected gaze. An instantaneous connection was made. It felt like a reverberating embrace of mutually reciprocating power - like a deep gripping handshake of the essence through the eyes. Like recognition of family. My eyes met each covenor's eyes in this manner, one by one. Then, at the end of the ritual procession, the Witch who lives upstairs revealed herself and came over to me as I came over to her. She walked with a smooth grace as if she was walking on air. Our eyes met eye to eye in the same manner as with the others. Yet, we also came together, resting our foreheads together like a mindkiss between and slightly above our eyes. Through this manner she spoke to me a secret of practical magic. She transmitted to me a sacred secret. The words she used concerned a special instruction of practical magic contradictory to something I'd recently learned, but in it was so much more. The words were a little drop, which now in me will unfold the teaching. Though she did not indicate to me that I should not tell the words of the secret, I feel that the words of the secret are not to be told. They are precious wholy words to me, so I shall not share the words through which the secret was transmitted. Commentary on Shoftim from Garden of the Dark Moon Jubilee - The Conditional Commandment. Good news! I got a pay raise at work. Yay! I've been with this particular employer for a year now. The average daily Medicare Rate for this quarter is 23% over last year's rate, the average daily Medicaid Rate is above both last year's Medicaid Rate for our facility and the average daily Medicaid Rate for Health Service Area-4 (our facility's state region), our facility received no regulatory survey tags related to the professional standards (or to any aspect) of the clinical care plans I write, and one of our corporate financial support persons told my Administrator that I am "on top of things" as it pertains to being able to analyze and report accurately and with insight on changes in our rates. The direction of my life has so improved over the last two years from the entire decade before. Apparently, Barak Obama's mother-in-law, first grandmother Marian Robinson, is a witch and practices Afro-Hispanic Witchcraft. She has been practising it since the 1980's. Check out Carla Calamity's website. She is the new witch of Wookey Hole! You go girl! There are seven runes and one 'empty space' in my runic name. The seven runes of my name shall correspond in my life to the seven days of the week. As Odin is the chief Divinity in Germanic tradition who guides souls, mediating between the conscious and unconscious realms, so too shall Odin's day (Wednesday) guide the week in my runic practice. Thus, the first rune in my name corresponds to Wednesday, the second rune to Thursday, the third rune to Friday, the fourth rune to Shabbat ... the fifth rune to Sunday, the sixth rune to Monday and the seventh rune to Tuesday. Interestingly, under Odin's guidance, the fourth rune in my name corresponds to Shabbat, the Jewish Sabbath day of rest. 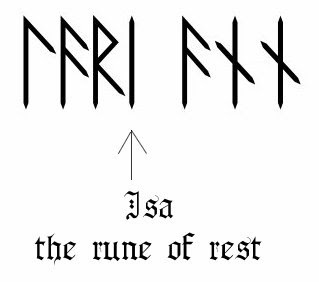 The fourth rune in my name is also the rune of rest, namely Isa. Beside Isa, rests the empty space in which the Soul of Shabbat Consciousness is pulled into manifest existence. All my Ancestors and the mysteries of the magical alphabets I've inherited from them are in harmony within me. Peaceful and full of well-being is my inheritance. It is כל טוב, all good. Laguz [praise-worthy one] - the layered lög (Law) of life, passage and initiation, growth, gathering of magical power and vital force, power of renewal. Through this rune I the runemaster am reintegrated into my primeval Ancestral Clan(s), guided life to life, initiated into the Ancient Dynamic Mysteries of Meta-Language, and embody the power of Synthetic Consciousness. Ansuz [firm foundation] - receiver, vessel, transformer and expresser of Ancestral mysteries, tradition, wisdom and knowledge. Through this rune I the runemaster take my place as One among the Divine Ancestors, and do embody a living link in an unbroken chain of esoteric transmission of magical tradition. Raidho [wholiness] - Divine Law Consciousness and innate instinctual order of wholiness. Through this rune I the runemaster dance - reckoning, balancing and harmonizing All and Nothing according to the Law of Wholiness with purpose, justice, and right action. Isa [stillness] - the rune of rest, the mystery of cosmic stillness, connection and concentration. Through this rune I the runemaster possess unity of purpose and being, bridge worlds and bond elements and energies of the cosmos into a tapestry of wholistic beauty. Ansuz [understanding] - mystery of Priestess consciousness, the mystical intelligence which brings together and synthesizes disparate elements of the Ancestral Ways in order to bring forth and achieve Understanding and Divine Consciousness. Through this rune I the runemaster function in my place as One among the Divine Ancestors embodying a living link in an unbroken chain of esoteric transmission of magical tradition. Nauthiz [step forth into manifestation] - mystery of Need and Intelligent Darkness, determination and endurance. Through this rune I the runemaster embody the resistance necessary to call forth deliverance and all that is needed. Nauthiz [to make with will-directed action] - mystery of the Need-Fire and Deliverance, the Intelligent Light of Awareness kindled and discovered through resistance, birthing innovation. With this rune I the runemaster call forth, create, direct, form, make and deliver All that is needed. Commentary on Re'eh from Garden of the Dark Moon Jubilee - Warding With Reverse Vision. I have many books in my library on the magical Hebrew and Ogham alphabets, the systems used by my Jewish and Celtic-English ancestors. Integrating these mystical alphabets into my spiritual practice has been a blessing. So much have I discovered through them. Now, having just acquired my own set of magical Runes, the magical alphabet of my Celtic-Germanic ancestors, and as I enter into the mystical art of runecasting, I have added some books to my library which explore authentic Celtic-Germanic runelore, philosophy and magic. May integration of this alphabet of my ancestors into my spiritual practice also be a blessing, and open up greater understanding into the mysteries uniquely entrusted to the Divine Spark which enlivens my soul. These books by Edred Thorsson are those I have chosen with which to begin my rune studies. Some people believe that to follow a traditional path means to follow one path, one tradition, one way. Perhaps for these some people, this is the truest way for them to be faithful to their Divine Spark. But for me, my Divine Spark is a multifaceted tapestry joyfully dancing with the light and shadows, with the joys and sorrows, of many peoples, of many paths, of many traditions. My traditional way is true to all that I am. Perhaps my traditional way is only mine. Nevertheless, it is true and faithful to my Divine Spark and to the Ancestors through whom my Divine Spark was called into existence. I am so happy that I am what I am. May all my Ancestors share in my happiness. So mote it be, אמן. The traditional home of the unicorn is known to be beneath the apple tree. Legend teaches that if a pure woman sits quietly beneath the apple tree, the unicorn will come, lay his head in her lap and allow her to fed him apples. In follow-up to my earlier entry, Still Alive In Me, and in honor of my Celtic-Germanic ancestors, I now own a handcrafted stunning set of magical runes made in the traditional way from a single continuous length of wood from a fruit-bearing apple tree. My set also includes a (blank) wyrd rune. 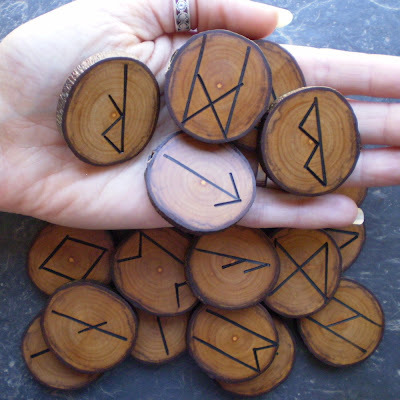 Each rune has the bark still attached and was sawn and sanded by hand, without the use of power tools. 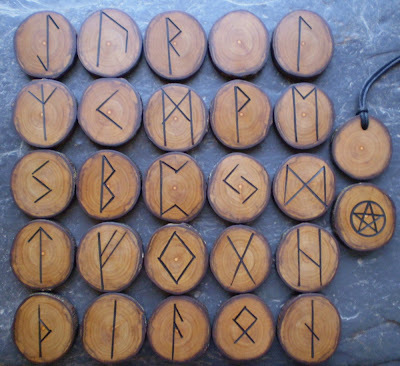 Each rune symbol was pyrographed into the wood (also without the use of an electric pyrography tool) by heating in a flame various metal straight lines of different lengths before applying them to the bare wood. When the time is right - perhaps around Samhain - each rune will be traditionally consecrated and stained with drops of my own blood mixed with red ochre on a white cloth (which will be ritually burned after the runes dry). I am making my rune bag in the traditional way as well - sewn by my own hand and fashioned from an article of my own clothing. I invite all my ancestors to attend the ritual preparation and consecration of my mystically magical runes. We are alive. May we all be a blessing and be blessed. This is just sweet and makes me feel inside like a little girl again, through all the seasons of my life. Commentary on Eikev from Garden of the Dark Moon Jubilee - Claiming The Blessing of Less. May this Sabbat bring only good to you and yours!